Cat toilet habits, it isn’t the most pleasant of subjects however it is something that all cat owners will know far too much about. We spend a considerable amount of time scooping out, replacing or cleaning out cat litter trays that we become experts on the subject; whether we want to or not. Well, we are here to help you out with your litter tray needs. We are presenting to you the very best (or at least coolest) cat litter trays that are out there at the moment. Some of them provide a real function, some of them simply look awesome but all of them make the process that little more bearable! 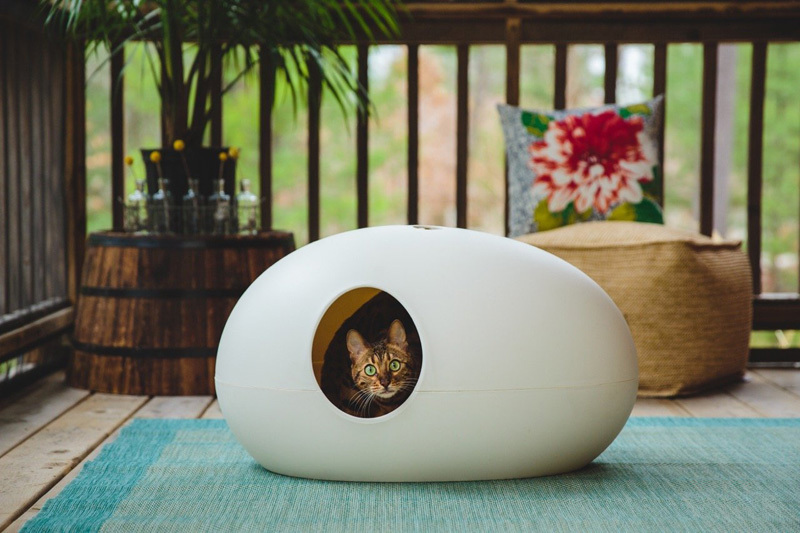 Featured above this funky little litter box (or shelter if you prefer not to fill it litter) is one that not only looks great but is a favourite for your kitty too. 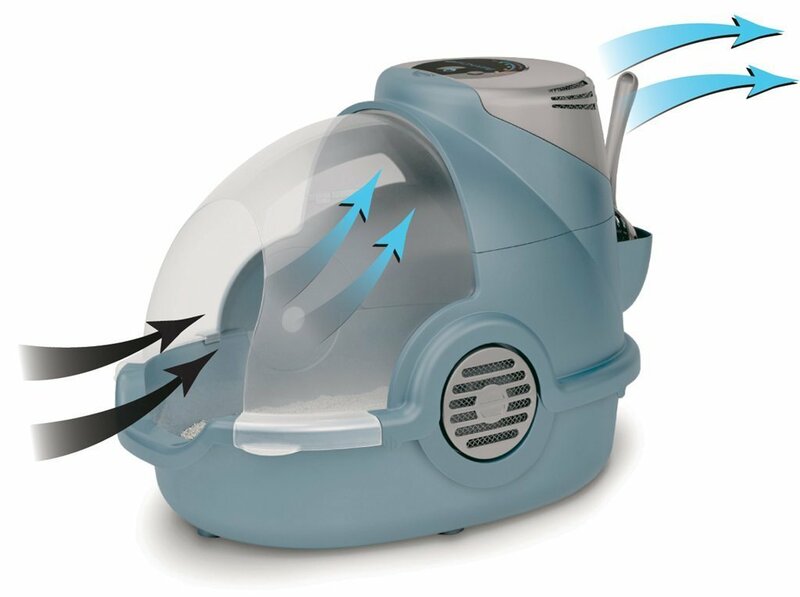 As it is completely enclosed it offers them privacy as well as keeping those unpleasant smells trapped inside. It also comes in a variety of colours meaning that you can pick one that fits in with your theme. You can find them over at PurrForm or here on Amazon. How much do you despair when you come home to find that your kitty has flicked litter all over the floor? This cat litter tray acts as a standard litter tray, but thanks to its tall rectangular design there is little to no overspill of litter. Music to our cat owners ears! You can find them here on eBay . If the smell of litter is your main frustration then this litter box might just become your new best friend. An in-built fan works to push the odours through a filter before returning the more pleasant smelling air into your home. No need to offer pegs to your visitors with this amazing litter tray. We found one here on Amazon. Does the idea of an auto cleaning litter tray fill your heart with joy? Well, be prepared to be overwhelmed. This litter tray does exactly what it says on the tin. This clever little gadget senses when your cat has used the tray and kicks in a 20 minute countdown. Once this countdown has finished a rake will sweep through the litter tray, removing the waste and placing into a contained waste trap! With this one we recommend getting the “Forever Tray” so you can just use normal crystal litter. You can get the ScoopFree from Amazon.co.uk and the Forever tray from Amazon.com Shipping is about $13 from the US to the UK as we couldn’t find anyone who stocked it in the UK. Of course, you could decide just to go for the more bog standard approach to litter trays. After all, one of the things to remember when it comes to owning any pet is that it is down to you to keep them (and anything they happen to use) clean and hygienic. Amazon’s best selling litter tray is £13.99 and comes in some funky colours. Cleaning out the litter tray isn’t our favourite thing to do but it is a process that you get used to, unless you manage to train them to use the loo! Are you are looking at litter trays for your kitty? If so we have a rundown of our top five litter trays, some funky some high tech and some best sellers. This entry was posted in Cats, Health, Style and tagged Litter, Litter Tray, Litter Trays.